These days, the notion of being required to pay a tax in order to cast a ballot seems anachronistic, but time has done nothing to dispel the arguments about whether voting barriers still exist – and whether they constitute a “poll tax”. The most obvious example is the continuing battle over voter ID, where opponents claim that the cost to obtain an ID – either directly or in the cost of supporting documents required to obtain a “free” ID – is tantamount to a poll tax. This argument has actually been quite persuasive, to the point where it is now standard practice for states requiring voter ID to provide it free of charge to voters who lack it. Indeed, the drive to ensure that cost is not a barrier is the new front in the war over ID, with plaintiffs arguing that difficulties in obtaining “free” ID should prevent or delay its implementation. We’ve also seen the concept of cost evolve past purely financial terms. Nowadays, whenever long lines at polling stations occur, there is the concern that voters are being asked to pay a “time tax” by being forced to wait. These concerns are especially acute when longer lines are not evenly distributed across communities. As the field of elections evolves, it will be interesting to see if the notion of a poll tax (in its more modern time/inconvenience formulation) also evolves. With the advent of wider opportunities for registration and voting, will the ability of some voters to register and vote more quickly be an issue with respect to those who cannot? Will wait times previously thought to be “short” become “long” as processes improve? And if they do, how (if at all) will policymakers and courts react? If nothing else, the 24th Amendment forces all of us to confront the “cost” of voting to the voter and decide when that cost is too high. However that line is drawn, I’m very confident that the idea of a “poll tax” will remain a powerful criticism of any election policy or procedure seen as creating financial and/or time barriers to voters. 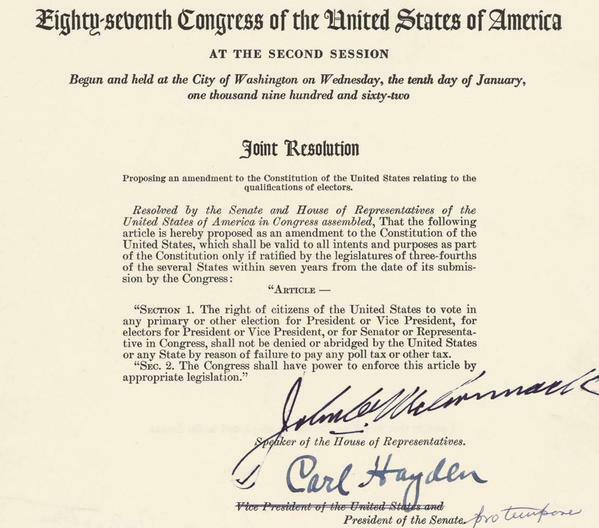 Be the first to comment on "The 24th Amendment at 51: Preventing (and Defining) “Poll Taxes”"